DMV Gold address, phone, website, hours of operation, and more. 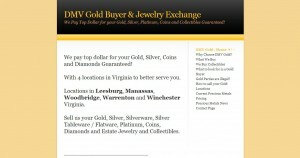 DMV Gold now offers gold testing with the latest technology using the Niton XL2 Precious Metals Analyzer. How do you know that the Pendant you brought it isn’t 22K and they are saying it’s 14K? You don’t unless they can show you! With the XL2 we can now show you the exact karat so you can sell with confidence. Every store is now equipped with the XL2 which delivers high accuracy so that we can offer you more than any other dealer, Guaranteed!